Lake Rosemound sits amid the hardwood forests of the Tunica Hills in West Feliciana Parish, approximately 14 miles north of historic St. Francisville, Louisiana and less than an hour from Baton Rouge. Historically the site of cotton plantations, the 2256 acre area was developed in 1960 by Lloyd Lindsey, Sr. and W.P. 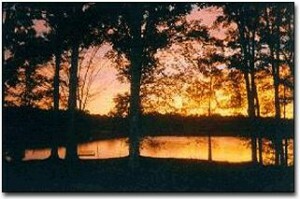 Groves as a private community for single family homes and camps nestled in the Louisiana woodlands. The community surrounds two spring-fed lakes (approximately 183 surface acres) where members enjoy boating, sailing, swimming, water skiing, and fishing for bass, bream, sac-a-lait and catfish. The 300 members of the Lake Rosemound Association, Inc. elect a Board of Directors with officers who govern activities and maintain the lakes, dams, beach and boat landing. The Lake Rosemound Community is recognized as a bird sanctuary, and provides safe haven for white egrets, blue and green herons, eastern bluebirds, cardinals, hummingbirds, and other feathered visitors. White-tailed deer, gray and red fox squirrels, and the uncommon eastern chipmunks are frequent visitors to the properties, which feature flowering dogwood, redbuds, magnolias, mock orange blossoms, roses, camelias, gardenias, tulip poplar trees, and azaleas. The Lake Rosemound Community is a spot of magnificent beauty and serenity, a place to relax and enjoy – a great place to live!